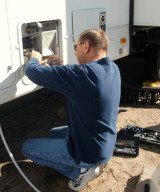 Is it possible to live comfortably full-time Rving in a cold climate? I have no experience with motor homes. I am wondering about the viability of full-time motor home living in the northeastern USA/Canada. We can get very cold winters here with heavy snowfall, but I would want to spend winters in this area to be near my family. Is it doable?